Being the crazy bird lady that I am, I often find myself wasting (although I use that term lightly) more time than I care to admit getting sucked into bird video after bird video on You Tube. And I’m not species-ist. I’ll pretty much watch any cute bird out there doing just about any cute birdie thing they do. With You Tube’s ever-increasing collection, the only problem is limiting myself. I’m sure you’ve danced that dance with yourself too – okay, just ONE more video, then it’s back to work with you! So I have decided to give you permission to tune it all out and enjoy a few minutes of birdie entertainment that is sure to brighten even the darkest of days. Even if you are not as big of a bird nerd as I, I guarantee that you’ll find at least one video below that you simply can’t resist. ***Note: For those of you reading this via RSS or email subscription, click on the post title link to be taken to the main site, where all of the videos are embedded onto one page for ease of viewing. Freeflight Toco Toucan – our baby Toco toucan pal, Rocko, and his Bird Tricks friends enjoying some spectacular freeflight time in the dramatic landscape of Moab, Utah. While it’s hard for me to imagine being able to do the same with my birds someday, it is certainly a dream worth dreaming. Kona & Rio – These two baby macaws seem to have formed their own baby macaw gang, a force to be reckoned with. Their vocalizations are hilarious. Frostie the Dancing Cockatoo – If this doesn’t have you busting up with laughter, there is something wrong with you. Seriously – something only a medical professional can help with. Storm, the Interrupting Amazon Parrot – This little parrot makes it impossible to get a word in edgewise. Thirsty Toucan Pixie – A fellow toucan, this one is a Swainson’s which is a bit smaller than our Three-Cans, sharing a glass of water, just like our Paco Taco does. Hyacinth Macaw & Pit Bull Playtime – I love how both the bird and the dog are into the game and do their best to make it work for each other. Plus, I am a sucker for inter-species relations. How Loud is a Moluccan – Years ago, I fell in love with a Moluccan cockatoo, as many people do. They are stunning birds in both appearance and intelligence, but this video shows perfectly why they are not for everyone. Bandit the Galah – This rose-breasted cockatoo has one of the cutest personalities I have seen. I’m a big fan of goofiness (hence the reason I am a Toucan Lady) and this video shows just how funny he is, chattering into a drain pipe. Macaw Playing Catch the Tail – This Blue-Throated Macaw finds it hard to resist the dog’s white-tipped tail. If I were that dog, I would be careful not to tease too much, for risk of losing my white-tip. Marnie the Indian Ringneck – Last, but definitely not least, is one of the most adorable birds on the planet, Marnie. It is difficult to choose just one of her videos, as they are all just “so cuuuuute!” (you’ll see what I mean…). 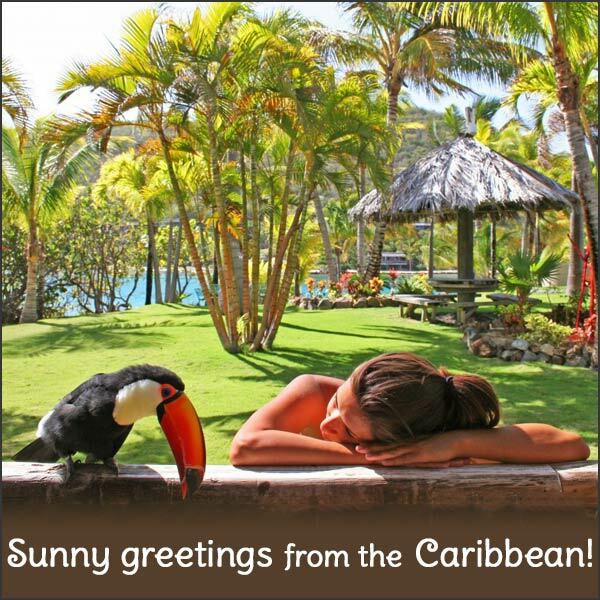 This entry was posted in Friends of Toucanland, Lists and tagged Adventures in Toucanland, bird, bird videos, birds, Caribbean birds, exotic birds, exotic pets, funny videos, island, Paco, parrot videos, Paz, Pepe, pet, pet bird, pet birds, pets, Saba Rock, Toco, Toco Toucan, Tocos, Toucan, toucan videos, toucanland, toucans, tropical birds, You Tube by Toucan Lady. Bookmark the permalink.